Regain control by joining a community of smart and ambitious young women that share similar concerns. The purpose of this group is to help individuals develop strategies to learn how to manage new expectations, resolve internal conflicts and strengthen their sense of self to maximize personal and professional satisfaction. 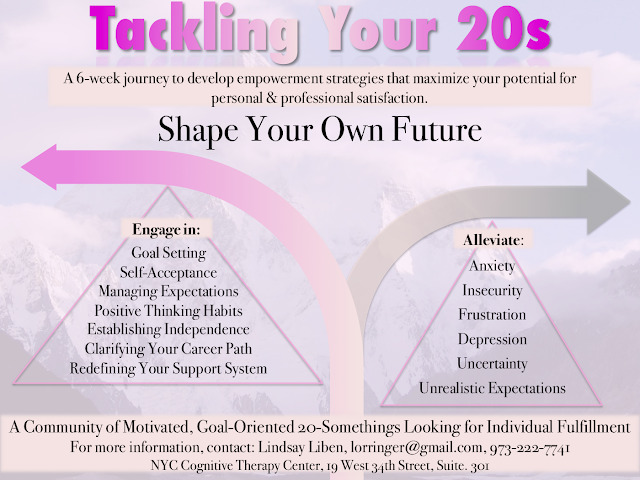 This 6-week program fosters empowerment strategies to strengthen your inner confidence and provide clarity on where your chosen path is headed. The info is below, screenings for the summer session begin in a few weeks (group will run in the evening, but exact day is TBD). It's $180 for the 6-weeks (which is less than a package for spinning classes in NYC).